NASA has just selected Gale Crater as the landing spot for its next Mars rover, Curiosity, which will launch late this year and arrive at the Red Planet in August 2012. Here's what you need to know about Gale Crater. How big is Gale Crater? The crater is 96 miles (154 kilometers) wide, giving Gale Crater about the combined area of Connecticut and Rhode Island. The crater is very large and has a number of interesting geologic features. It is in a low-elevation position on the Martian surface, meaning that if there was water on the surface of Mars in the past, it likely ran downhill into Gale Crater. The crater features a formation called an alluvial fan that was likely formed by water-carried sediments. In the middle of Gale Crater is a mountain rising higher from the crater floor than Mount Rainier rises above Seattle. The mountain contains various sediment layers with different minerals that were formed during different periods of Mars' history that can reveal clues about what Mars was like in the past. The layers at the base of the mountain contain clays and sulfates, both known to form in water. "The site offers a visually dramatic landscape and also great potential for significant science findings," said Jim Green, director for the Planetary Science Division at NASA Headquarters in Washington. This oblique view of the lower mound in Gale crater shows layers of rock that preserve a record of environments on Mars. Was there ever life in Gale Crater? That's one of the main questions Curiosity is aiming to investigate. The conditions there, from what we know so far, indicate that it might have been a favorable spot for microbial life on Mars. Hopefully the rover will reveal more. 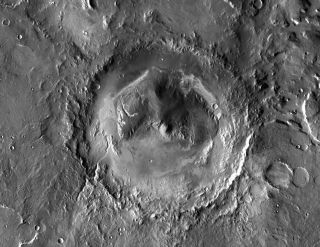 "We believe that at Gale Crater, we have located that boundary where life may have sprung up and where it may have been extinguished," Brown University planetary geologist John “Jack” Mustard said in a statement. "That’s why were going there." Why is it called Gale? The crater is named for Australian banker and astronomer Walter F. Gale (1865 – 1945), who discovered a number of comets and binary star systems. Inspired by the appearance of the Great Comet of 1882, Gale built a telescope with a 7-inch (18-centimeter) mirror, the first of many that he owned. Gale was a founder and organizing secretary of the New South Wales branch of the British Astronomical Association. Curiosity is NASA's $2.5 billion Mars Science Laboratory mission. It is a car-size rover that will launch late this year and land in Gale Crater in August 2012. It boasts a suite of 10 different science instruments and 17 cameras. Over the course of about two Earth years, researchers will use the rover's tools to study whether the Gale Crater region on Mars has, or ever did have, favorable environmental conditions for supporting microbial life. The rover will also study the region's geology and geologic history to learn more about how Mars formed and evolved over time.